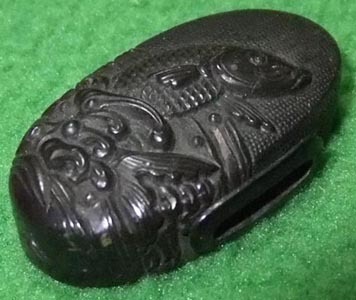 How are the fuch/kashira made? How are the Fuchi and Kashira made? We have received that question from a customer. 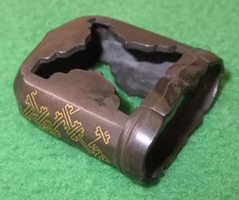 Most of case, the fuchi is made with three parts soldered. 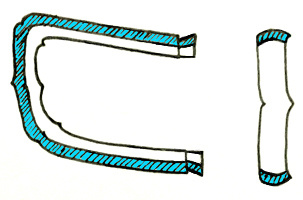 Those are ring, support tip and the flat plate. Kashira is bent from one plate. The relief on them is punched on the reverse and engraved on the obverse. Various metals can be inlaid or plated. 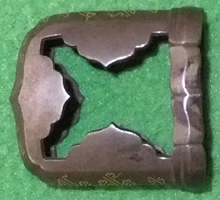 On the kashira in tachi style, it is made with two pieces. Those are bent ring and hoop. They are either soldered or just set by snapping. Only on the iron fuchi, there is a unique way to make. The ring is made by welding, and the flat copper plate is set inside of it. The flat plate is not soldered. It is a classical method. Sometimes we find it in old Higo style fittings. Today, there are a few metal craftsmen who make sword fittings. Mass-products are made by casting. Usually we search antique fittings to produce sword mount. On the other hand, sometimes we make some fittings instead of finding rare ones. Home > Information, Other fittings > How are the fuch and kashira made?